Daily Fragrance: Atelier Cologne Vanille Insensee. This little cutie is from the nicely-priced Miniature Discovery Collection. 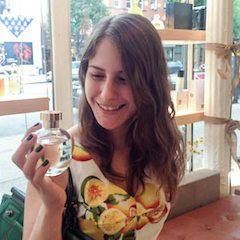 Vanille Insensee is my ex-boyfriend’s fragrance, so I hadn’t worn it in years. I’d forgotten how well-made and instantly appealing it is. Daily Nail: Urban Decay Pulp Fiction Nail Color in Deep Red. On sale at Sephora for the ridiculous price of $5. (The Pulp Fiction palette is on sale, too!) It has a very subtle shimmer that I completely failed to capture in this photo. Daily Graphic Novel: Jane Mai Sorry I Can’t Come In On Monday I’m Really Really Sick. My favorite cartoonist had a book launch last weekend! I had a lot of champagne. Disclaimer: This post does not contain affiliate links. 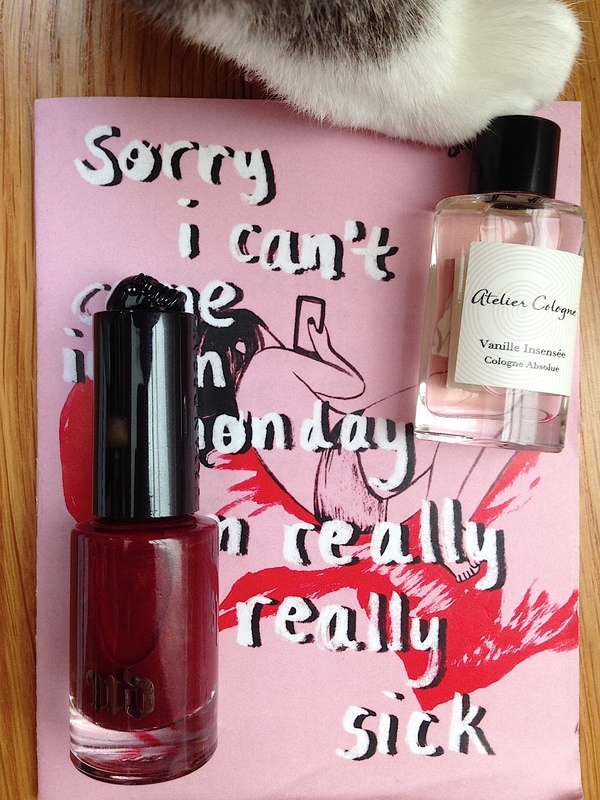 All products (and paws) featured in this post were my own purchases, much to my wallet’s dismay. Vanille Insensee is a nice one. I have a mini that I got at Sephora, and I like it a lot. It also has great staying power on me. One of my cats likes it too. If I’m wearing it she’ll start licking my arm. Also.. that nail polish! Want. I’m a sucker for shimmery reds (metallic or glittery), so I frequently have to remind myself when tempted that I probably already have something similar enough that buying this one would make no sense. I’m wearing Frapin Speakeasy today. It’s a nice sweetish fall tobacco with a hint of leather and booze. I like it a lot. I actually wanted to wear Volutes but couldn’t find my decant this morning, but this is working nicely.